The first clear evidence of the species survival was presented in early April and has aroused considerable attention. It has also highlighted the importance of conservation and urgent needs for the many threatened and endemic species found in the Sierra Nevada de Santa Marta. 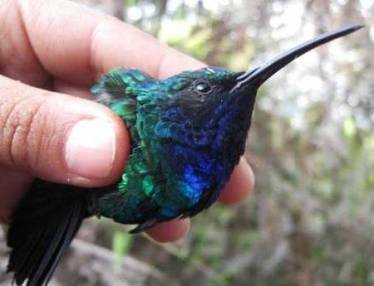 The record generated interest for ornithologists within Colombia that reported a capture and photo of the Sabrewing just months before, but unfortunately the record was not published nor made public. Nevertheless, there have been several observations each year by researchers and visitors since 1999 in the area of the reserve down to the town of Minca, but unfortunately firm evidence has never been obtained. Santa Marta Sabrewing (Campylopterus phainopeplus) by Laura Cárdenas on 27th March 2010. On the 27th April 2010, ProAves celebrated an agreement with the new NGO called SELVA that now manages the Cruzando el Caribe project within the El Dorado Reserve. The photo is thanks to the Cruzando el Caribe Project and SELVA. Even sound recordings of Sabrewing vocalizations, possibly of Campylopterus phainopeplus, were recorded by Niels Krabbe board member working for ProAves in Feb 2007. The exact comments on the recordings were “Three or four birds appearing to be Campylopterus phainopeplus were observed and tape-recorded as they fed from a flowering Inga tree at 1150 m on 24 February 2007.” However, as noted by Niels Krabbe, Campylopterus falcatus was not confirmed, but known to be in the same area. So despite some discussion, it remains clear that the first published photos Read article is the first clear evidence of the Santa Marta Sabrewing existence in over 60 years. 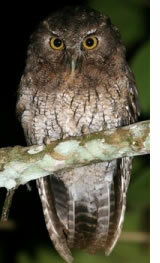 Some errors were published in a press release issued by American Bird Conservancy, however ProAves and their research has made much progress in ornithology in the area, including a new species of Megascops Screech-owl. The identification of a distinct species as the Ruddy Foliage-gleaner (Automolus rubiginosus rufipectus) (read more) that is endemic to the Sierra Nevada de Santa Marta, the first investigation and recording was done by Dr Niels Krabbe within the Natural Reserve El Dorado (11° 5’28 .78 “N, 74 ° 4’26 .27″ W). Not only is this taxa distinctive, but it may even be more closely related to a genus Hylocryptus composed of two species in southern Ecuador and Peru and Brazil. The species, named the Santa Marta Foliage-gleaner Automolus rufipectus was studied by Niels Krabbe inside El Dorado Bird Reserve and is restricted to closed canopy primary subtropical forest, which is extremely fragmented and predominately cleared for agriculture. While know to occur in other sites in the Sierra Nevada, the species highly restricted range and sensitivity of habitat suggest the species be considered Vulnerable to extinction. 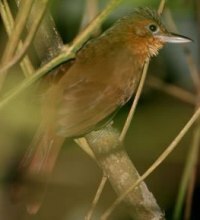 Preliminary analysis of vocalizations from El Dorado by Dr Niels Krabbe and are now on sale while species rank is likely to be appropriate for five other taxa, including the Masked Trogon (Trogon personatus sanctaemartae), Montane Woodcreeper (Lepidocolaptes lacrymiger sanctaemartae), Rufous Antpitta (Grallaria rufula spatiator),Gray-breasted Wood-wren (Henicorhina leucophrys anachoreta), and Stripe-headed Brush-finch (Arremon torquatus basilicas), and possibly others. We thank the media for its interest in showing the importance to science and conservation of the Sierra Nevada de Santa Marta, now we must push actions for its conservation.